Summer Soles chic Sandal Insoles are the best solution for sweating feet and foot perspiration problems for sweaty feet. If you're using prescribed medications, you should give Summer Soles a try. The combination may be just the right combination. While we can't stop you from sweating, we are so sure you'll like how you feel in Summer Soles, we provide a full Money Back Guarantee. 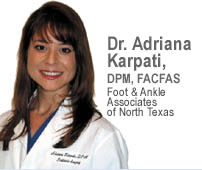 "I recommend Summer Soles to all my patients who want instant relief for their perspiring feet. They are an easy, inexpensive alternative to topical applications and provide benefits that medications simply cannot, such as reducing friction with shoes." While sweating is a natural function of the body, it can cause severe distress for those of us with excessively sweating feet. Problems can range from simple uncomfortable squish to downright dangerous slipping or falling in shoes from sweaty feet. If you think you have a foot perspiration problem, visit your local podiatrist or dermatologist. Although there is no cure for sweaty feet, a doctor can explain all the treatment options available to you, including Summer Soles - certainly one of the quickest fixes available for sweaty feet issues. Until now, summer footwear just hasn't acommodated sweating feet. Summer Soles open shoe insoles fit edge-to-edge, remove with no residue, and can be changed as often or as frequently as you'd like - so no matter how much foot perspiration you experience - it's like having a new pair of shoes everytime you slip them on. Summer Soles make every sandal or open shoe feel fresh and fabulous - true comfort for sweaty feet.